The Jagran | Where Is Annie? Less than a kilometer away from Sri Ram Ashram is a small village, Shampyur. It is so quiet compared with the big city, Haridwar, six kilometers away. But one night the quiet was disturbed. A family in the village hosted a jagran and invited their neighbors. Rashmi, the director of the ashram, and a group of older kids planned to go. My family was also invited as part of the ashram family. During a jagran devout Hindus spend all night honoring the mother goddess, Durga. Durga is remembered for destroying the evil forces who would have otherwise destroyed the other gods and thus, the world. Her name means invincible in Sanskrit. She is usually depicted riding a tiger who represents power, will and determination. Her eight or ten arms represent the many directions in Hinduism. We arrived at the jagran at about nine at night to a tent in the backyard. A few family members were sitting cross legged on blankets. 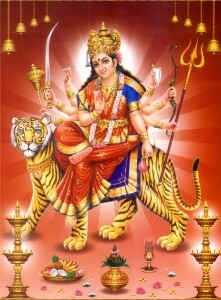 They were seated in front of a large alter with a life sized statue of Durga riding a tiger, her eight arms fanning out around her. She was draped with necklaces of fresh marigolds and was flanked on either side by similarly large statues of many of the other Hindu gods including Shiva and Ganesh, Hanuman and Lakshmi. Incense burned at their feet. Strings of multicolored lights flickered around them. There was a bit of glorious kitsch to the large, plastic statues with the flickering lights and the perfume of incense. A slender, greying priest sang while seated in front of the statues, the hosting family gathered around him. Devotion to Durga filled the tent as the priest prayed into the microphone. More guests arrived, filling the tent. Soon the musicians came. They brought an electric keyboard, a mridangam (a tubular drum with skins on both ends) and an electronic drums. The drums were set to sound like tablas but were played with drumsticks. The new singer now stood, and the priest stepped aside. The volume of the speakers was increased, and the sound board was set on reverb. Catherine and I tried to move back away from the speakers. Only then did the rear speakers start amplifying the music. We were stuck between four loud speakers, and we had forgotten our ear plugs. After two hours of trying to sit cross-legged on the floor while covering our ears we decided it was time to leave. We knew we weren’t going to be able to stay the whole night celebrating Durga. We thanked our hosts, but we couldn’t get past the fire where the food was being prepared. Chairs were placed in front of us, cups of chai were placed in our hands, and plates of chick peas, aloo gobi, and puris were set down in our laps. It turns out, in India, “No, thank you,” is not accepted as an answer when one is offered food. At least not as we mean it in the West. In India, it means, ask me again and then make me take what you’re offering even if I say no again. We were only allowed to leave after we’d licked our plates clean. It was well after midnight.